A "Tummy Tuck", or abdominoplasty, is performed by Dr. Lowell Hughes for patients in our region to flatten their protruding abdomen by tightening the muscles in the abdominal wall and removing excess fatty tissue and skin. This surgical procedure is a common one and can benefit men and women who are bothered by a protruding abdomen. Keep in mind that while a tummy tuck will enhance your figure and your self-confidence, it's not likely to change your life or the way people treat you. During your private consultation with our physician, you should explain your goals and expectations of the surgery. Our surgeon will assess the nature of your abdomen, your expectations, and explain the probable outcome of your procedure. There are three basic techniques used to flatten a protuberant abdomen. The best technique for you will depend largely on your goals and your specific problem. Liposuction alone can produce a thin abdominal wall for some. If your laxity and excess skin is below your navel, a mini tummy tuck may be right for you. 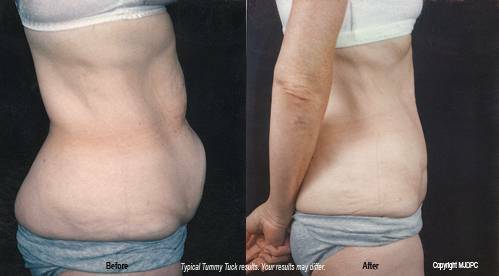 For those with severe laxity of their abdominal muscle or excessive skin, a full tummy tuck may be their only solution. A mini tummy tuck is usually performed in conjunction with liposuction of the upper abdomen and the flank areas. With a mini tummy tuck, a smaller incision is made in your bikini area and no incision is made around your belly button. Our surgeon will remove your excess skin and fat through this incision. Permanent sutures will also be placed through this incision to tighten the muscles of the abdominal wall. After Dr. Lowell Hughes performs your tummy tuck, bed rest is recommended for the first day. Most patients experience some numbness in the area of their abdomen, which may last as long as a year. Any pain or discomfort that follows surgery can be controlled with oral medication. If drains are used, they may remain in place for 3 - 7 days until discharge fluids decrease. Sutures will be removed in 1 - 2 weeks, however, your bandages may remain a little longer. A special abdominal support garment is often necessary for several weeks. There will be some scarring that will fade significantly over time. During your recovery, you must refrain from any strenuous activity or lifting. Most patients are back to work within 1 - 3 weeks, depending on the degree of surgery. Our surgeon will decide when you can resume normal activities.